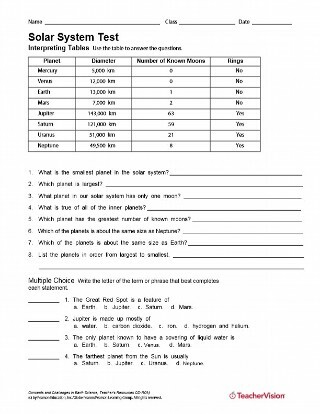 Multiple-choice questions in this space-science exam are used to test students' knowledge and understanding of the solar system. Topics include space probes, celestial mechanics, solar system bodies, moons, planets, and dwarf planets. Students will also compare data in a table about the planets, explain the formation of the aurora borealis, and hypothesize why astronauts wear space suits.